Before you take out invoice finance read this. 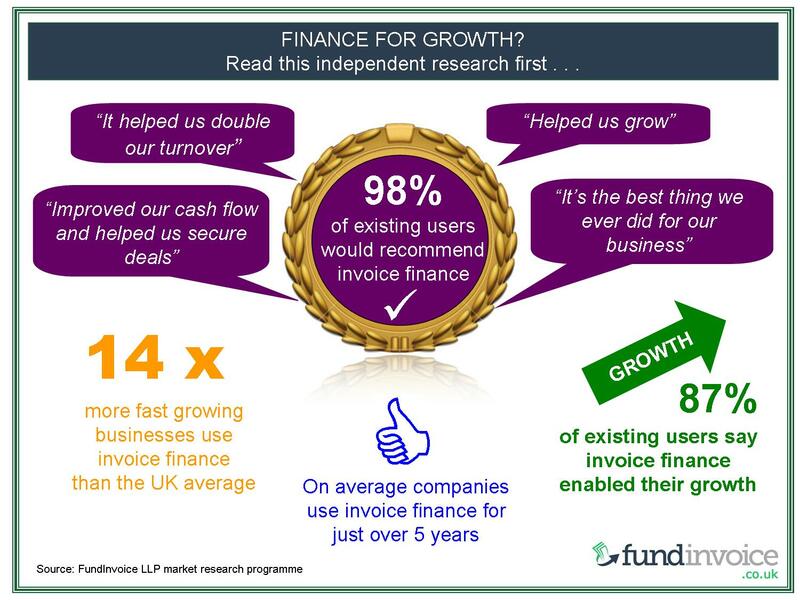 FundInvoice LLP has produced this free, extensive UK archive of invoice finance research regarding factoring (with credit control) and invoice discounting. This is essential information for anyone considering using invoice or sales finance or thinking of changing invoice finance companies. We want to share some of the findings and reports from our extensive invoice finance market research programme. Our findings are shared online, individually, via Glenn Blackman's Invoice Finance Blog which provides a searchable database of the various findings. We have the findings from numerous surveys related to invoice finance and business funding generally. We have undertaken extensive amounts of research in order to understand these products and the differences between offerings. We have a summarised our invoice finance pricing related research and information into a single post that draws together multiple studies across various different products. Invoice finance company online search for customer reviews. Are revolving lines of credit more popular than single invoice finance? Which invoice finance companies are rated most highly by their customers. The percentage that recommend invoice finance to fast growing companies. Levels of awareness of different products (e.g. factoring, invoice discounting & construction finance) and providers. What are the barriers and pitfalls to businesses taking up invoice finance. What would clients like to see improved and offered. How clients would like products to be structured. How fast growing companies and new start ups fund their businesses. Business Finance Research Summary May 2016 - this simple list of bullet points summarises the key finding to date from our business finance research programme. Invoice Finance Research Report July 2015 - a summary of the research findings from January 2015 to July 2015. Including: percentages that will recommend invoice finance; eligibility; why customers pick invoice finance; advertising methods being used; price checking; how to increase user numbers; switching invoice finance companies and overdraft versus alternative finance. 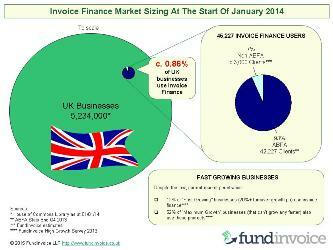 Invoice Finance Research Report January 2015 - a summary of the research findings 2013 to January 2015. Including: sizing the UK market, invoice finance for fast growing businesses and new startups; client life; customer satisfaction differences and mystery shopper invoice finance pricing results. Mystery Shopper Full Report - August 2014 - a full report of the findings from our invoice finance mystery shopper pricing survey. Mystery Shopper Summary Report - August 2014 - a summary of our mystery shopper study amongst our panel of confidential invoice discounting, recourse factoring and non recourse factoring companies to find the top 3 cheapest quotes for each product. Invoice Discounting Clients Survey Findings - March 2014 - a survey of 54 existing invoice discounting clients that were asked to rate and review their invoice discounter. Factoring Clients Survey Findings - March 2014 - a survey of 46 existing factoring clients where they were asked to rate and review their factoring company. 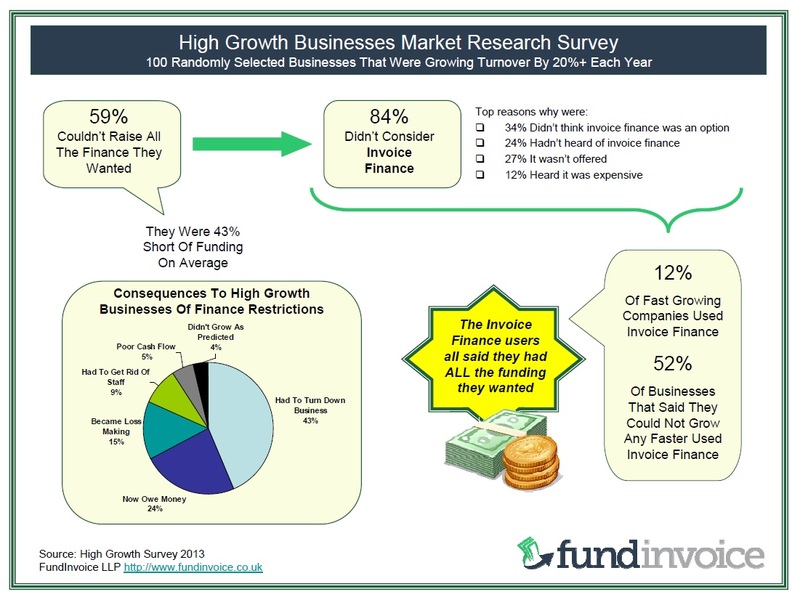 Invoice Finance Market Research Summary Part 3 - the 3rd part of a summary of our historic research findings. Includes preferences for a tariff of charges vs. fixed fees and detailed research regarding construction finance and funding against applications for payment within the construction sector. Invoice Finance Market Research Summary Part 2 - the 2nd summary which covers: raising the profile of invoice finance; what is missing from the IF market? ; what customers don't like about invoice finance; what they expect to pay for invoice finance and how clients suggest we promote these products. Invoice Finance Market Reserach Summary Part 1 - the 1st summary which covers: the potential size of the invoice finance market; why more businesses don't use invoice finance; the 8 most well known invoice finance companies; who is most actively marketing; research regarding bank overdraft; how businesses choose their invoice finance company and their detailed pricing expectations. Creative Sector Late Payments - Research by Marketinvoice about late payments in the creative sectors. Late Payment Problem? - Pulling together various pieces of research about UK late payments amongst SMEs. Comparison Of Pricing And Funding Levels - a comparison for a Confidential Invoice Discounting client. The Economic Impact Of Brexit On UK Late Payments - an survey of the opinions of UK companies. Changing Invoice Finance Companies - why product choice influences propensity to move between providers. Reasons For Non-Payment In The Construction Sector - why construction sector businesses fail to get paid. Awareness Levels of Receivables Financing - findings about the low levels of awareness of these cash flow products. 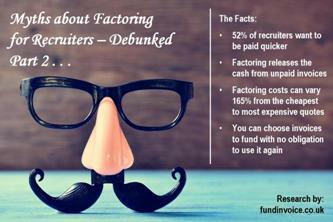 Recruiters Still Not Considering All The Funding Options - many recruitment companies are still not aware of these options. Sources Of Funding Used By Recruiters - how recruiters tend to finance their businesses. Recruiters Want Customer Late Payments To Improve - how late payments are affecting the sector. Construction Sector Financing Market Research - summary of our findings about the construction sector. Why Invoice Finance Works For Manufacturers - how manufacturing companies can benefit from debtor finance. Advertising Of Crowdfunding, Payday Loans & IF - article highlighting the levels of awareness of alternative finance. Users 7 Times More Aware Of Payday Loans Than Invoice Finance - comparative between loans and receivables finance. What Stops Invoice Finance Users Moving Providers? - the barriers to moving between factoring providers. 71% Don't Want To Change Invoice Finance Companies - findings about satisfaction levels amongst those using IF. Advertising Invoice Finance Versus Crowdfunding - comparative with crowdfunding. 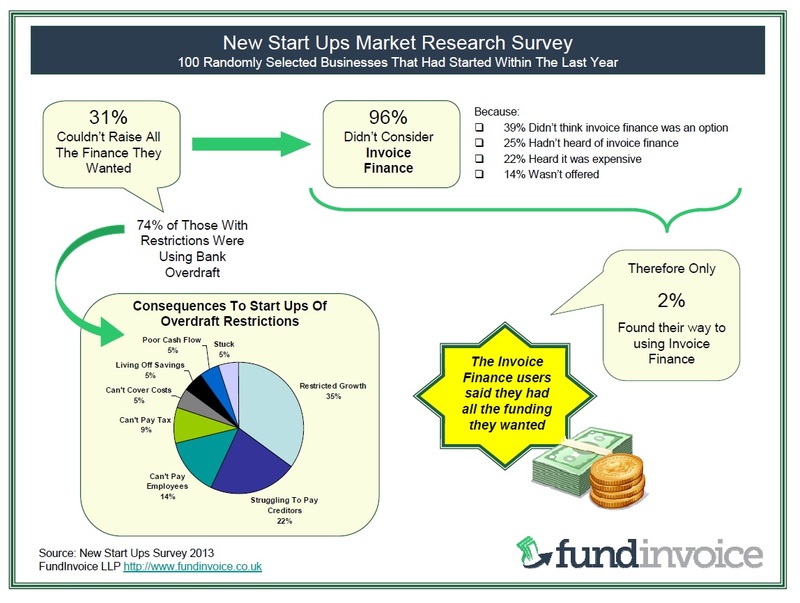 53% Recommend Invoice Finance For New Startups - startup finance that is freely available and often overlooked. 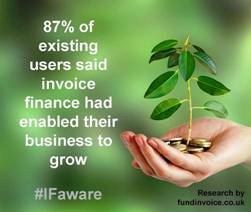 Confirmed - 87% Say Using Invoice Finance Enabled Growth - how debtor finance has enabled business growth. 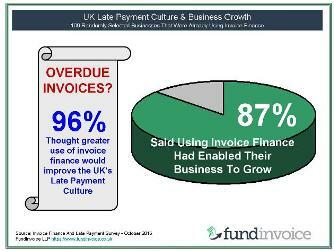 96% Think Use Of Invoice Finance Will Tackle UK's Late Payment Culture - tackling late payments in the UK. HSBC Invoice Finance Review - a review of HSBC Invoice Finance. 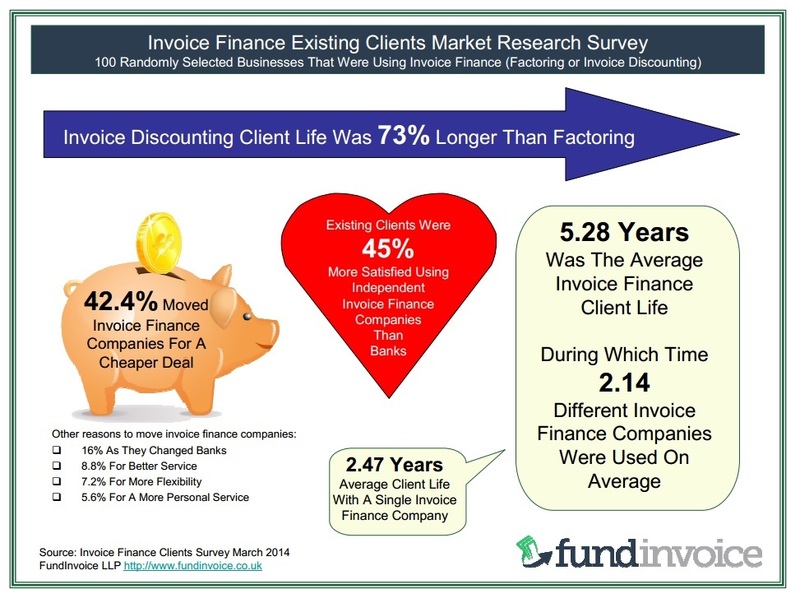 15.5 Years - Average Age Of Invoice Finance Users - the average client life within this sector. 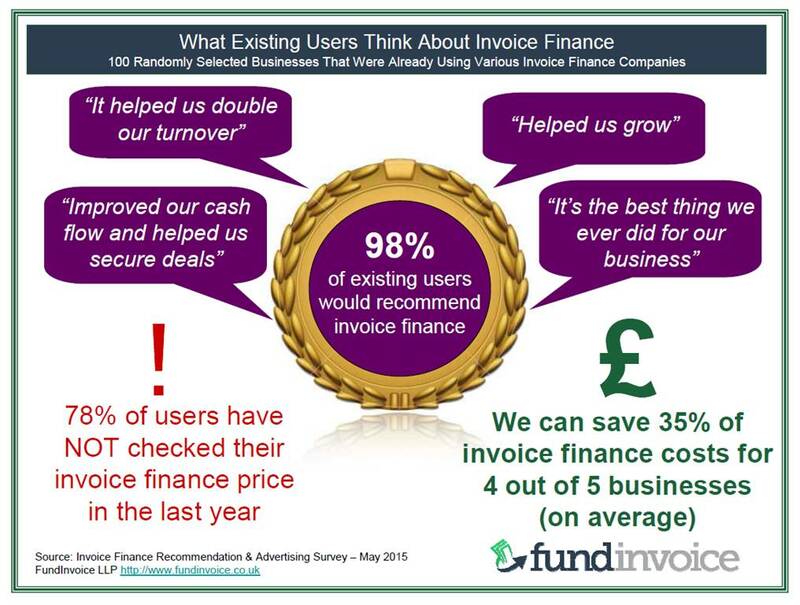 Quotes From The 98% Of Users Recommending Invoice Finance - what existing users say. Overdraft Versus Alternative Finance - The Gap Narrows - alternative finance becomes more available. Invoice Auction Sites And Selective Invoice Finance - views on selective and invoice auction sites. Switching Between Invoice Finance Companies - moving providers. 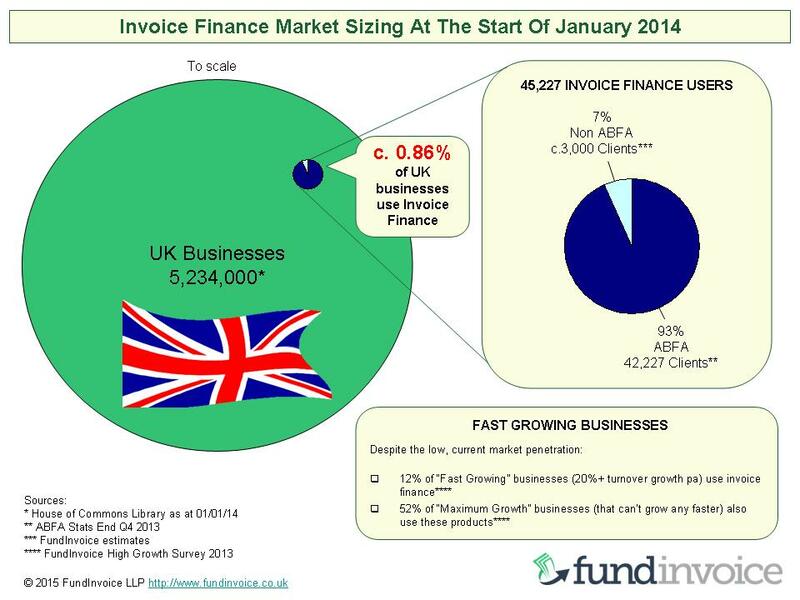 47% Haven't Seen Any Invoice Finance UK Advertising - low levels of advertising awareness. 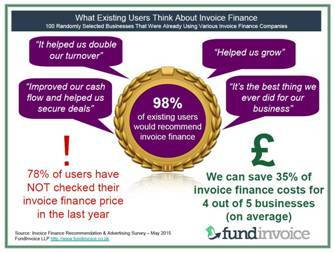 What Percentage Of Existing Users Would Recommend Invoice Finance? - views from existing product users. The Reasons Non Bank Introduced Users Picked Their Facility - why customers choose their facilities. How Businesses Find Invoice Finance - routes to find debtor financing. How To Improve Your Invoice Finance Facility - suggestions for invoice financing companies. The Answers - How To Increase Invoice Finance Client Numbers - ways to grow the sector. Revealed - Why Clients Pick Particular Invoice Finance Facilities - choices between facilities explored. Why More Businesses Don't Use Invoice Finance - the reasons on 1% of UK businesses use receivables finance. Presentations relating to our Invoice Finance Market Research Programme. You can see our research related videos on our FundInvoice YouTube channel. Many of our research findings are shared via our blog. You can find all the research related blog posts here. We encourage anyone to reuse our results in order to promote the industry. Use of our findings is free of charge and we only ask that you credit FundInvoice LLP for the research and provide a follow link back to this page. We are currently releasing the results from our survey of existing invoice finance users - there will be a further research summary in due course but the findings are published to the blog (see above) as they arise. If you have suggestions for future surveys we would be pleased to hear from you. All data and information provided in this document and the links to other sites are for informational purposes only. Neither Glenn Blackman nor FundInvoice LLP take any responsibility for this data or the content of any other sites, and make no representations as to the accuracy, completeness, currentness, suitability or validity of any information in this document or the sites it links to. Glenn Blackman and/or FundInvoice LLP will not be liable for any errors, omissions or delays in this information or any losses, injuries or damages arising from its display or use. All information is provided on an as-is basis.